Fall is here in Bariloche. Every morning's pretty cold and all the leaves are almost off the trees. 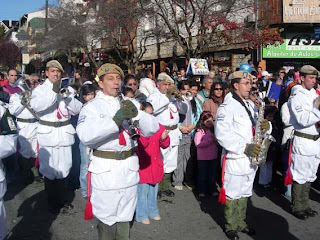 Last weekend the girls marched in a parade through the city for Bariloche's birthday. They marched with their school and joined their classmates at 10:30 across town. They marched in parades in Greenville, but those were very small and in fact so many people were marching that there would hardly be anyone to watch. 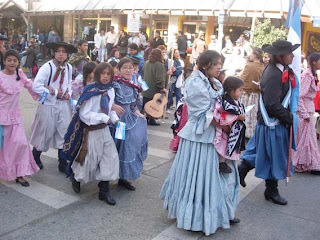 This was a HUGE parade in a city with thousands of people milling around in a huge array of costumes. My kids were awestruck. 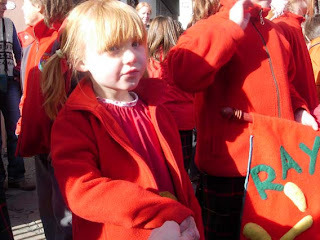 Phoebe as we gathered to march. Naomi looking ready to go. Phoebe's class posing with their teacher. 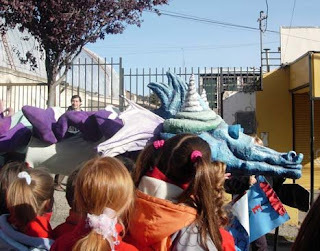 A dragon passing by to march ahead of us. This is a band that was great. Here is the school starting to march. 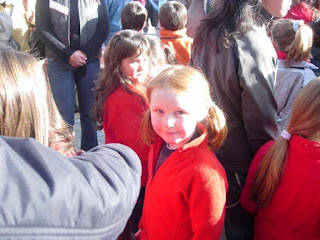 "Rayitos Del Sol" is the name of the new kindergarten, which Naomi is a part of. They asked all the parents to submit a name and vote on it, but we bowed out. It's hard enough to fumble our way through a conversation in spanish let alone come up with clever titles. 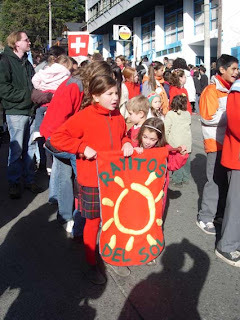 It means "Little rays of the sun", which is cute and works well with the school's name. 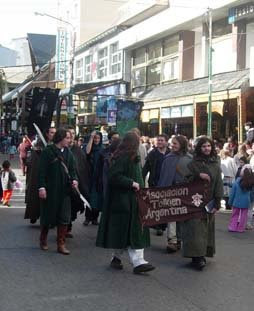 This is the Tolkien Society of Bariloche. They had great costumes!! This is a very tall couple on stilts that Phoebe liked a lot. 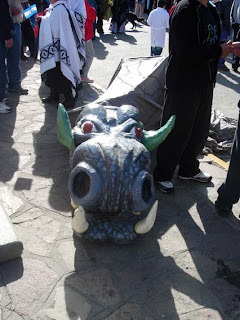 This is one of the dragons after the parade. 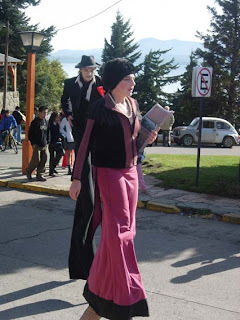 Here are some Gauchos (Argentine cowboys), walking by in traditional dress, unfortunately we didn't get any pictures of the 20 or so on horseback. When we brought the kids down to meet the school van early on Thursday morning, the street, the ground and trees were all covered in what looked like snow. I used this as an excuse to force winter coats on the kids, who adamantly refused every freezing morning previous to this one. Today they couldn't argue and trudged off to school wearing their coats. 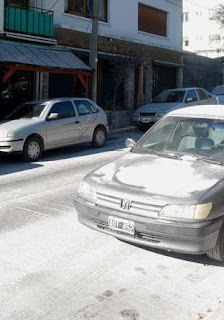 It wasn't until Mike and I went out later and noticed the dusting of snow wasn't melting and wasn't cold to the touch, so like an idiot I touched a little to my tongue and discovered it was ash from the volcano that exploded in Chile on May 2nd. Here you can see it covering a car outside our apartment. Here you can see all the ashes covering the square outside. 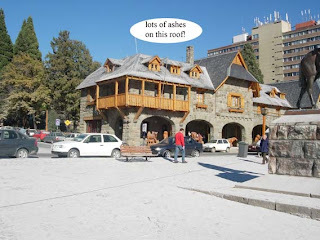 Fortunately for us, here in Bariloche, the volcano eruption only means a bit of street cleaning. 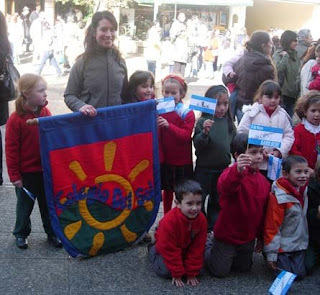 Sadly it's much more of a problem over in Chile, where many people have had to evacuate. For anyone keeping up with my blog, the money Phoebe found on our trip to Chile during Easter is from The People's Republic of China, it's a 1962 one Jiao note. 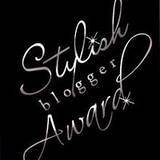 Muchas Gracias to my cousin Nancy and my Uncle Kent who both looked into it for me. Hasta luego.